FIRST BY-ELECTION AFTER GE 13! The by-election follows the death of BN’s Dr Abdul Rahman Mokhtar on Wednesday, two months after he defeated PAS’s Napisah Ismail by a majority of 2,434 votes. The by-election is seen as critical as it could possibly decide the next Terengganu state government. This is because a win for PR would lead to a hung state assembly with both BN and PR having 16 seats each. After the general election, the state seat count stood at 17 for BN and 15 for PR (PAS with 14 and PKR with one). A PAS candidate stood against Dr Rahman on May 5. – June 29, 2013. ….here is another question: why allow a partisan group to conduct the country’s elections and devalue the ultimate right of any citizen in a democratic country – the right for your vote to count. Surely, this too amounts to bullying, extortion, unfair and arrogant behaviour. The Election Commission (EC) is working to purchase indelible ink from a new supplier for the Kuala Besut by-election, said EC chief Abdul Aziz Mohd Yusof. “We will try to get a better ink that can avoid past weakneses… It will be from a different supplier and we will announce its silver nitrate content later, but we will ensure that its silver nitrate content would (be enough to) make it indelible,” he told a press conference today. 2 Hantus and Banglas on the electoral roll. 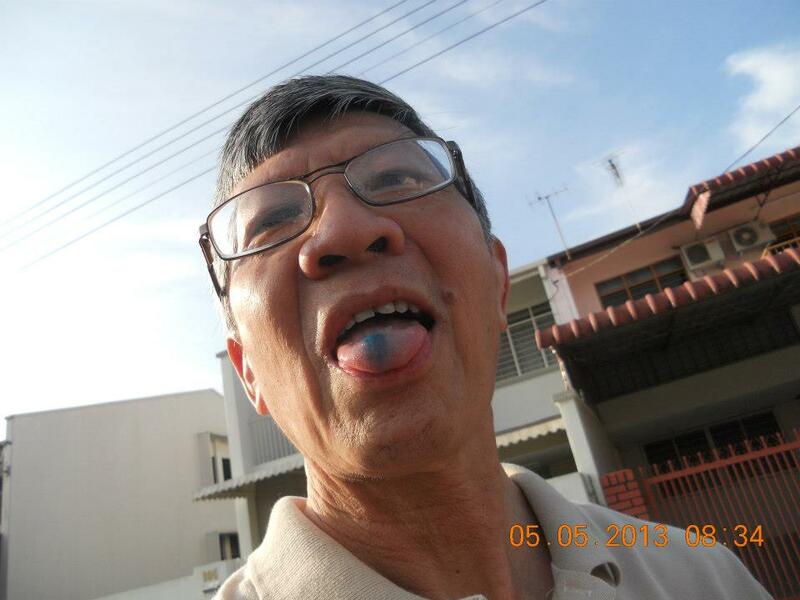 On 5 May, I had licked the ‘indelible ink’ with my tongue. Now I know that it’s food coloring! Food Dye was used as Indelible Ink for GE 13! 4 A new trick BN-UMNO may introduce!!! UMNO IS SO CONFIDENT OF WINING THAT IT WANTS A ‘LIVE’ BROADCAST OF THE WHOLE WORKS, FROM VOTING TO THE VOTE COUNTING! RTM cameras in Kuala Besut vote counting room? The Communication and Multimedia Ministry will discuss with the Election Commission (EC) soon to allow RTM to give ample coverage of the Kuala Besut by-election. This includes placing RTM’s cameras in the vote counting room. “Before that, I will discuss with the technical side on its present capacity. People know that the counting of ballot papers starts at 5pm. Even if there is a ‘blackout’, they will be able to view it live,” said its minister Datuk Seri Ahmad Shabery Cheek after opening a media seminar on the 13th General Election in Kuala Lumpur today. Opposition leader Datuk Seri Anwar Ibrahim has demanded that the Election Commission (EC) make no more “heroic” statements pledging to improve the quality of the indelible ink. The issue, he said, is beyond repair. “The EC have been behaving like court jesters rather than performing their due tasks,” Anwar said. That was a jab at all the EC’s comments and attempts to justify the problems arising from the use of the indelible ink in the general election last month. He added that based on the EC deputy chair’s statement that the same ink will be used in the upcoming Kuala Besut by-election, it just goes to show that there will be no foolproof way to run the by-election. “The mandate given by the public to the EC has been gravely abused, so what trust is there left anymore?” Anwar said. Anwar said that given the meek manner in which the government has handled the issue so far, the EC should not be allowed to play the role at which it had failed so miserably in the general election. This entry was posted in Uncategorized and tagged anthony loke DAP, BN, Food Dye was used as Indelible Ink for GE 13, GE13, kuala besut by-election, lim kit siang, malaysia, No chemicals, only food colouring in EC's ink, Pakatan Rakyat, PAS, politics, PR, Rafizi Ramli (PKR-Pandan), terengganu, UMNO. Bookmark the permalink.